In a statement released by Urjit Patel, he said he stepped down as the RBI Governor on "account of personal reasons". He thanked his colleagues and staff and expressed his gratitude. It is with great sadness that I received the news of the resignation of the Governor of the Reserve Bank of India, Dr. Urjit Patel. I have known Dr.Patel to be an economist of high repute and also someone who cared deeply about India's financial institutions and economic policy. 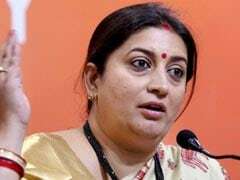 Dr.Patel's sudden resignation, at a time when the Indian economy is faced with many headwinds is very unfortunate and is a severe blow to the nation's economy. There have been apprehensions expressed earlier by the Deputy Governor of the RBI about the government's intent to raid the capital reserves of the RBI for fiscal purposes. I hope the resignation of the Governor is not a sign that this may soon become a reality. Building institutions take a long time and effort but they can be destroyed in a whimper. It is institutions such as the RBI, among many others that have served as the edifice of our great nation's progress since independence. It will be foolhardy to diminish these institutions for short-term political gains. I wish Dr. Urjit Patel success in his future endeavours. 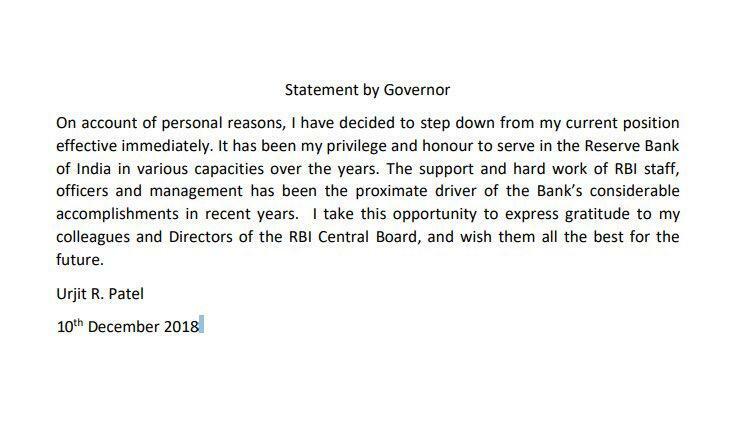 I also sincerely hope that this sudden resignation of the Governor is not a harbinger of the Modi government's attempts to destroy the institutional foundations of India's $3 trillion economy. Pinarayi Vijayan tweeted: The resignation of RBI Governor Urjit Patel is disturbing, though there is little to be surprised about it. The incumbent Government at the Centre has time and again proven their expertise in destroying Institutions. The voices of reason and sanity are being stifled. It didn't start with RBI and it won't end with it. At this rate, they will bring about an "institutions-mukt Bharat" soon. The resignation of RBI Governor Sri Urjit Patel is a sad culmination of BJP led union govt's destructive efforts to demolish critical national institutions. First CBI, now RBI. If this destruction continues, no institution will survive and Indian democracy will be in deep danger. Tejashwi Yadav tweeted: First CBI and now RBI.. With the resignation of Governor Urjit Patel it is clear that for the first time in 70 years these institutions are being forced to organize looting, vengeance, corruption and dishonesty. 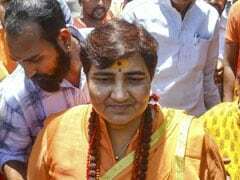 They have to go soon, otherwise they will destroy all constitutional institutions and values. Reports of RBI Deputy Governor Viral Acharya quitting are incorrect, news agency ANI quoting RBI spokesperson. P Chidambaram on Urjit Patel's resignation: Saddened, not surprised, by Dr Urjit Patel's resignation. No self respecting scholar or academic can work in this government. November 19 was the day of reckoning. Dr Patel should have resigned on that day. Dr Patel may have thought that government will re-trace its steps. I knew it would not. Good he quit before another humiliating meeting. Kapil Sibal on Urjit Patel's resignation: He has cited personal reasons. Won't comment on them, strange that people appointed by them are resigning. Ex-CEA, now Urjit Patel. Decline in financial conditions. Ex-CEA has hinted at slow growth, has said that note ban hurt and that GST wasn't implemented properly. Urjit, Subramanian, Raghuram Rajan, they feel that PM thinks that he is the biggest economist, that he doesn't need others, he defends note ban. They changed GDP back-series too. Mamata Banerjee proposes opposition should meet again Tuesday, meet president on RBI issue. Mamata Banerjee on RBI governor's resignation: From CBI to RBI, institutions have become total disasters; it is matter of great shock. The Karnataka Congress tweeted, "Resignation by RBI governor Urjit Patel is the reflection of Narendra Modi's attempt to sabotage institutions to push his own MODIfied economic theories. No educated economist can tolerate such attempts of amateurs." Urjit Patel has resigned because he is not able to functions, says Congress chief Rahul Gandhi. "All Indians should be concerned," says ex-RBI governor Raghuram Rajan tells news agency Reuters after Urjit Patel quits. Amid attacks by opposition over Urjit Patel's resignation, PM Narendra Modi today tweeted: "Dr Urjit Patel is an economist of a very high calibre with a deep and insightful understanding of macro-economic issues. He steered the banking system from chaos to order and ensured discipline. Under his leadership, the RBI brought financial stability." "The government acknowledges with deep sense of appreciation the services rendered by Dr Urjit Patel to this country both in his capacity as the Governor and the Deputy Governor of The RBI. 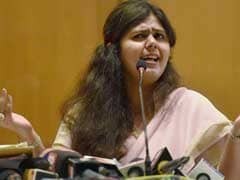 It was a pleasure for me to deal with him and benefit from his scholarship," Finance Minister Arun Jaitley tweeted. Soon after announcement of Urjit Patel's resignation, AAP tweeted: "Told you so"
Since the very first day, @ArvindKejriwal has been saying that #Demonetisation is the biggest scam of India ever. In his statement, Urjit Patel cited "personal reasons" for his resignation. Read the full statement here. Minutes after RBI Governor Urjit Patel announced his resignation, Congress tweeted: "Another one bites the dust". 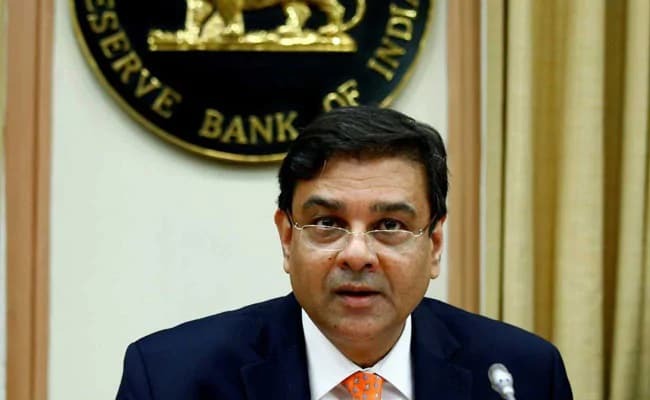 The grand old party, in an apparent reference to PM Modi, posted on Twitter: "This is the result of our 'chowkidar's' assault on democratic institutions - RBI Governor, Urjit Patel steps down." Urjit Patel had assumed charge as the RBI chief on September 4, 2016.